Read Across America is celebrated on March 2nd. 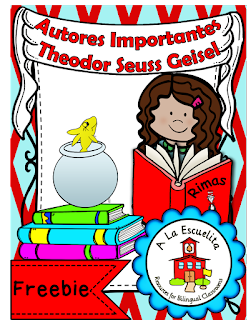 March 2nd is a special day, not only because it's Dr. Seuss's birthday but also because we focus on the enjoyment of reading! We take out our Dr. Seuss books, we read, read, and read some more. We work on activities related to the books and we eat a cupcake in Dr. Seuss's honor! Everyone knows that Dr. Seuss is the author of "The Cat in the Hat" is but do you really know who Dr. Seuss is? Did you know he never got a doctorate degree, therefore he never really was a doctor? 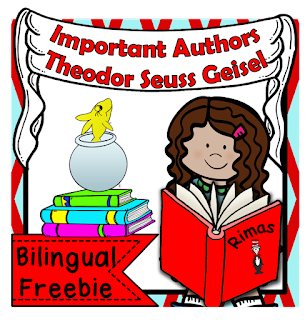 This and other fun facts are included in this Dr. Seuss Author Study, a freebie in both English and Spanish for your students to enjoy. Hi Angie, thank you for this great freebie on the life of Theodor Seuss Geisel! It looks perfect for this month!